Why Choose Prior as an OEM Partner? 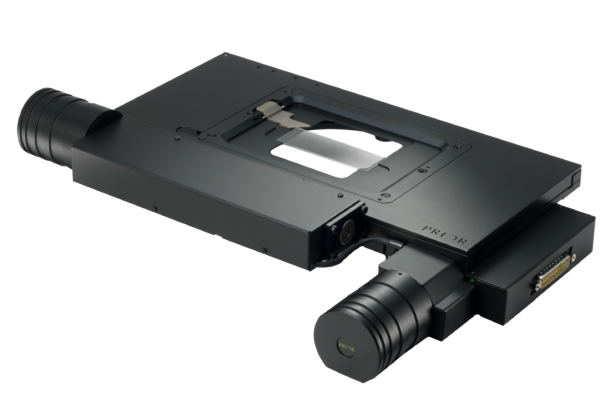 The H101A ProScan™ stage is adaptable to virtually any microscope or optical system. The H101A stage enables the user to increase labor efficiency by automatically scanning your specimens and storing points for later recollection and inspection with unmatched repeatability. The H101A is ideal for scanning or inspection of slides, microtitre trays, semiconductor wafers, or metallurgical specimens in any sort of pattern, including raster, snake and random patterns. The H101A ProScan™ stage also incorporates the patented – Intelligent Scanning Technology (IST). In conjunction with extensive testing, Intelligent Scanning Technology (IST) allows each stage to be pre-programmed with a unique set of operating characteristics particular to that stage to ensure optimum performance. IST (also available on H107 and H117 models) allows the ProScan™III controller to make any required adjustments to maintain superior orthogonally and metric accuracy. Requires the use of a Prior ProScanTM II or above controller and are based on Prior method of testing. *Using a Prior ProScanTM controllers with backlash correction enabled, all repeatability is Uni-directional. Values in ( ) represent Average performance. **S.P.R: Full steps per revolution of motor. Suitable for most major brand microscopes.